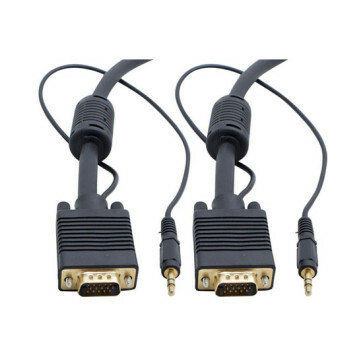 The SVGA (Super Video Graphic Array) monitor cable with audio has an integrated audio lead with a 3.5mm plug on each end. This cable provides video and audio transmission in a compact one cable set. It is an ideal choice for applications where video and audio are both important components of the presentation such as an entertainment, commercial video presentation and point of sale display. Both the HDB pin metal shells and the 3.5mm 3 pole plugs are gold plated for better contacts. Sturdy construction of SVGA heads and audio cable branch-out ensures durability and long lasting performance.protection. Audio 3.5mm Length - 600m one end and 400mm the other end.